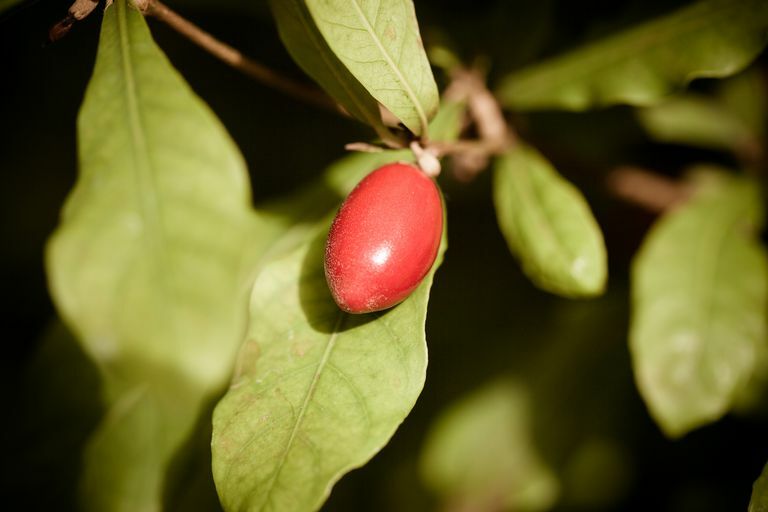 Miracle fruit (Synsepalum dulcificum) is a type of fruit native to West Africa. Eating miracle fruit is known to alter the flavors of certain foods—for example, chewing the berries prior to eating lemon can cause the latter to taste sweet rather than sour. Research suggests that miracle fruit's flavor-modifying effect is due to miraculin, a protein found in the berry. Miraculin appears to alter the shape of proteins on the tongue responsible for sensing sweet flavors. As a result, these proteins (known as "sweet receptors") respond to acidic or bitter foods in a way that creates a sensation of sweetness. Although miracle fruit is often used to experiment with flavor changes, there's also widespread interest in the berry's potential health benefits. For instance, some doctors are exploring miracle fruit's ability to increase appetite in certain populations of patients (such as those undergoing chemotherapy). Widely available in tablet form, miracle fruit is also sometimes touted as a weight loss aid. Preliminary research suggests that miracle fruit may be beneficial in the treatment of diabetes. In a study published in Phytotherapy Research in 2006, scientists fed miracle fruit to a group of rats placed on a diet high in fructose (a type of sugar known to increase blood sugar levels). Results showed that miracle fruit helped protect against insulin resistance, a health problem closely linked to the development of diabetes. In a pilot study published in the Clinical Journal of Oncology Nursing in 2012, researchers found that miracle fruit may be of some benefit to patients receiving chemotherapy. The study included eight patients with cancer, all of whom were experiencing chemotherapy-related taste changes. A common side effect of chemotherapy, negative taste changes can result in poor nutrition and reduced quality of life. For the study, half of the patients were given a two-week supply of miracle fruit, while the other half were given a two-week supply of a placebo. After two weeks, the treatment and placebo groups were switched. Looking at food diaries and taste-change ratings submitted by each patient, the study's authors determined that miracle fruit had a positive effect on taste changes. Miracle fruit may benefit people who are trying to reduce their calorie intake, according to a small study published in the journal Appetite in 2011. In an experiment involving 13 people, researchers gave each participant a lemon-juice-based popsicle that was either low in sugar or sweetened with sucrose (also known as "table sugar"). Some of the study members were also given miracle fruit prior to eating their popsicles. All popsicles were consumed after the subjects had eaten a standard breakfast and lunch. Analyzing the participants' food intake for the remainder of the day, the researchers found that study members given both miracle fruit and the low-sugar popsicle consumed fewer calories (compared to those who ate either the sucrose-sweetened popsicle or the low-sugar popsicle without miracle fruit). Given this finding, the study's authors concluded that miracle fruit can enhance the sweetness of low-sugar desserts while limiting calorie intake. Although miracle fruit is generally considered safe when consumed occasionally as a food, the safety of long-term use of miracle fruit supplements is unknown. Miracle fruit berries and seeds are widely available for purchase online. In addition, some nurseries sell miracle fruit seeds. You can also purchase miracle fruit tablets in many natural-foods stores and stores specializing in dietary supplements. Due to the limited research, it's too soon to recommend miracle fruit as a treatment for any condition. It's also important to note that using miracle fruit in treatment of a chronic condition (such as diabetes) and avoiding standard care may be harmful to your health. If you're considering using it for any health purpose, make sure to consult your physician first. Chen CC, Liu IM, Cheng JT. "Improvement of Insulin Resistance by Miracle Fruit (Synsepalum Dulcificum) in Fructose-Rich Chow-Fed Rats." Phytother Res. 2006 Nov;20(11):987-92. Koizumi A, Tsuchiya A, Nakajima K, Ito K, Terada T, Shimizu-Ibuka A, Briand L, Asakura T, Misaka T, Abe K. "Human Sweet Taste Receptor Mediates Acid-Induced Sweetness of Miraculin." Proc Natl Acad Sci U S A. 2011 Oct 4;108(40):16819-24. Theerasilp S, Kurihara Y. "Complete Purification and Characterization of the Taste-Modifying Protein, Miraculin, From Miracle Fruit." J Biol Chem. 1988 Aug 15;263(23):11536-9. Wilken MK, Satiroff BA. "Pilot Study of 'Miracle Fruit' to Improve Food Palatability for Patients Receiving Chemotherapy." Clin J Oncol Nurs. 2012 Oct;16(5):E173-7. Wong JM, Kern M. "Miracle Fruit Improves Sweetness of a Low-Calorie Dessert Without Promoting Subsequent Energy Compensation." Appetite. 2011 Feb;56(1):163-6. Yamamoto C, Nagai H, Takahashi K, Nakagawa S, Yamaguchi M, Tonoike M, Yamamoto T. "Cortical Representation of Taste-Modifying Action of Miracle Fruit in Humans. " Neuroimage. 2006 Dec;33(4):1145-51.